The many different kinds of pastry which are made in Britain today have evolved over the centuries from a crude flour and water dough mixture invented by the Romans. The paste was wrapped around meat and game before roasting and was not intended to be eaten. It served only to retain meat juices and aroma. As time passed the pastry was enriched with fat and milk, and began vaguely to resemble today’s shortcrust. By Medieval times, pastry-making was well-established and rich-crust pastry covering known as coffers became as important as the fruit, meat, fish and game pies they covered. 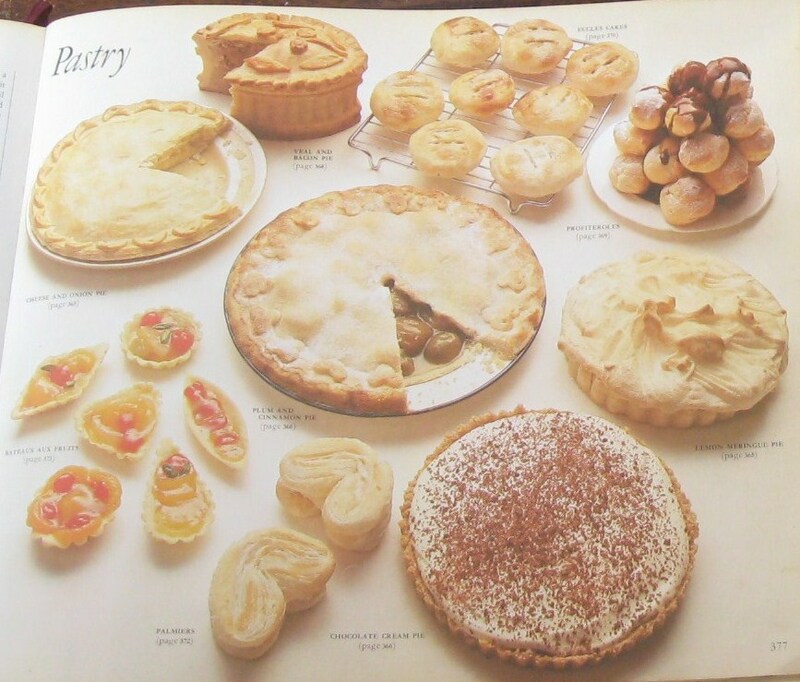 As different areas and localities developed their own puddings and pies, many pastry variations emerged from the basic fat, flour and water recipe. Perhaps the most famous of all is the 14th century raised hot water crust. This was indigenous to Britain and was used with meat and game pies. It was moulded from the inside with a clenched fist, in the same way as a clay pot and then filled and baked until crisp and brown. The method is perpetuated in Melton Mowbray pork pies. Text and pastry illustration from The Reader’s Digest Cookery Year, Basic Cooking Methods, Pastry Making by Margaret Coombes and Suzanne Wakelin of Good Housekeeping Institute (1976 edition). Illustration of jam tart and recipes for sweet and savoury vol-au-vents from The Good Housekeeping Cookery Compendium, (1956 edition). 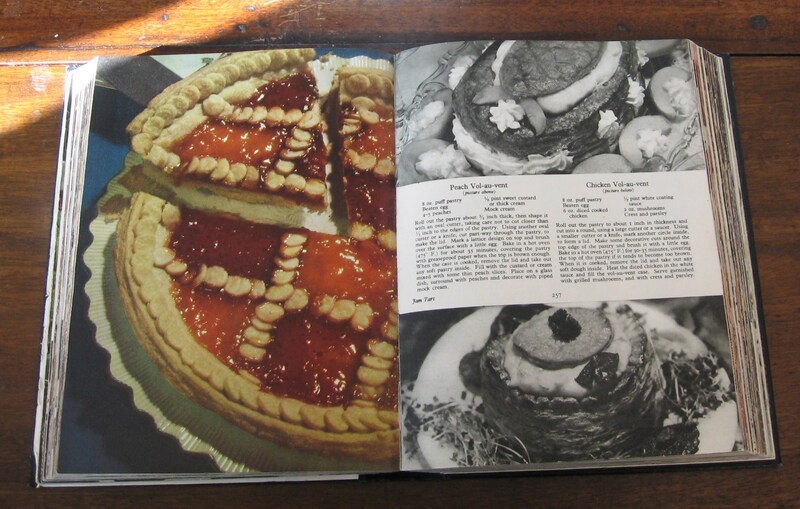 Dating from an age when baking day was a major event, firing up a hot oven, large batches of pies were made and then stored in a cool larder for later use. Traditional crust finishes were based on the need to identify savoury from sweet pies in storage. Savoury pies were decorated with pastry leaves, tassels etc, and glazed with beaten egg for a rich colour. The fluting (scalloped edge) was widely spaced, say 2-fingers width. Sweet pies were not adorned. If glazed, egg white only was used, or simply water with a dusting of fine sugar. The fluting was closer together, 1-finger width. Click here for common faults in pastry making (and how to avoid them).